Note cards based on the Stained Glass Windows of Pratt Hall make great Christmas cards and wonderful gifts. Check out the "History For Sale" link on our Home page. 1. The current Town Highway garage is being dismantled and will be replaced by a larger Public Works Building. When was the old highway garage completed? 2. 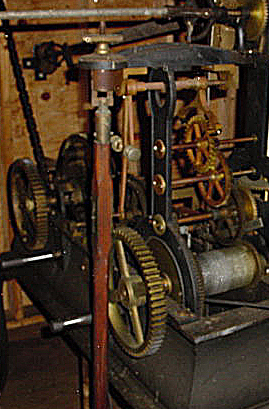 The clock in Pratt Hall is called a turret clock and has two trains powered by two weights. What are the two names? The final chapter of Albert Camus' "Myth of Sisyphus" ...compares the absurdity of man's life with the situation of Sisyphus, a figure of Greek mythology who was condemned to repeat forever the same meaningless task of pushing a boulder up a mountain, only to see it roll down again. Camus' essay concludes, "The struggle itself...is enough to fill a man's heart. One must imagine Sisyphus happy." Source - Wikipedia. Now it chimes every hour, despite a relatively modern modification that is supposed to prevent it from chiming late at night or early in the morning in deference to our immediate neighbors. This is obviously a highly technical module because it includes an old hinge, spring, and electrical conduit clamp. 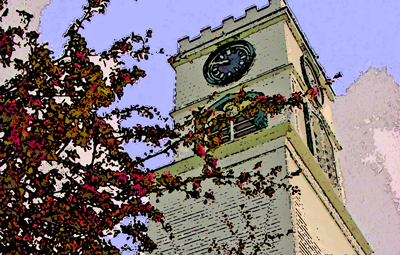 Over the past 25 years the care and feeding of the clock has been the responsibility of several hardy souls who have been willing to climb 65 feet to the top of the tower at least weekly, and wind the clock or trouble shoot repairs. You can imagine what it's like in the middle of January. Clock winders have included George Roberts, Sonny Lumbra, Rocky Elkins, Pat Farmer, and yours truly. Most recently Luke Scheffler has joined the brotherhood which I like to call the Pratt Hall Quasimodo Society. Our thanks to all of them. So when I drive by the Hall I always look at the clock (and the building) and am reminded "it's the struggle itself", and smile. Thanks for joining the struggle, I hope you smile too. Our historic timber frame expert, Jan Lewandoski, has had his hands full working on the Breeding Barn (below) at Shelburne Farms and said he will begin work on Pratt Hall in late October and stay with it until it is finished. We started demolition of the steps earlier this summer but stopped when it became apparent earlier concrete pours had penetrated the rubble stone foundation. We expect the jack hammers to see action soon. We are looking for donations of labor, materials, and anything else we can use as part of our in kind grant match so don't be shy. Contact Bill McGroarty at 933-2673 or drop us an email. Our annual concert series treated us to quite a variety of live music - Brass, Jazz, and Harp/Flute. Thanks once again to Steve Hays for pulling all this together. This year's series saw attendance dip but revenues hold steady so we will break even financially. Thanks to all of our sponsors and patrons. We wouldn't be able to keep the series going without all of you. VT Council on the Arts, Inc. The Board and Steve will be discussing the future of the series between now and February when next year's grant application is due. We solicit your ideas and comments on what we might do to improve attendance. Please email us or drop a note. We are eager for your feedback and ideas. Would you be willing to lend a hand working on the series? Montgomery and the Society are about to be featured in two publications. 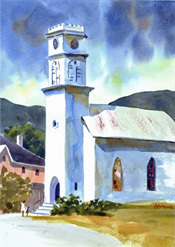 Vermont Magazine's November-December issue will likely feature Montgomery under its Vermont Towns regular feature. They took pictures at Pratt Hall and may discuss some of our recent accomplishments. Also, the St. Albans Messenger plans on doing a special section on the County's Societies to include a series of articles on each Town. We provided the MHS skinny and an article based on the Nelson and Hall packing case exhibit. As I write this I'm waiting to hear from the Vermont Historical Society. The Board nominated Betty Stanton for a League of Local Historical Societies Lifetime Achievement Award, citing among other things her 17 years of service on our Board and four years as President. She's already a winner to us! UPDATE: We were just notified Betty was selected. More details in the Jan 2011 newsletter. Yea Betty! It's never too early to start thinking about Christmas and of course that means Carols and Candles. We're tentatively planning on Sunday evening, December 19th but will need to confirm that after we get some snow on the ground. Stay tuned. Dee Pratt recently sent us a daguerreotype of Jim's great grandfather and his wife, Edward and Nancy Furnald, along with information regarding the Pratt Farm (now Beth Crane and Morgan Daybell's) and their former house in the Village. Thanks Dee! If you have something you think should be part of our collection please don't be shy. We'll give it a good home if we can and can even provide a receipt for your taxes. We will make our next push to enter archival records into our computer data base this fall. We're using the "down" time between now and the holidays for data entry and other archival maintenance. When Joshua and Naby Clapp settled in Montgomery in 1793, no one lived in any neighboring town for over two years afterward. That's isolated! Thanks to our members that bank with TD Bank and designate the MHS their Affinity non-profit charity. TD Bank will make an annual contributionto the MHS based on our level of participation. Still inbound this fiscal year... a $1,500 grant from the Eastman Charitable Trust and a $7,500 grant from the VT Div. For Historic Preservation. Affinity Program Members - 73. In the past we've been approached by people who wanted to include the Society in their estate planning and asked that we provide the necessary tax information and documentation of our non-profit status. They said they were looking for a way to make a tax deductible contribution to a local group and the MHS fit the bill. We were honored to be considered. Similarly we've received money and artifacts specified in people's wills over the years, or donations in lieu of memorial flowers. "I give ___________ to the Montgomery Historical Society, having its principal offices at 2044 North Main Street, Montgomery, Vermont 05470, for its general purposes." Or you might designate the MHS as the recipient of a gift annuity, or retirement plan proceeds, or name the MHS as the recipient of a percent of your estate. Likewise you could donate an item to our archives so future generations could learn from and enjoy it. The MHS is a 501.c.3 non-profit organization. We know this can be a delicate subject but want you to know that we are very grateful for such support and would be honored to work with you if you have similar desires. Please contact us for more details. Notecards are available for purchase. Set of 4 just $6.00. As of this writing our membership stands at 196 households and $9,300. Thanks to all of you for joining or renewing. We'll continue to accept memberships through the end of the year and I'm confident we'll hit our 200 member / $10,000 goal. Jo Anne Bennett reports she's completed her initial round of research for the Third Edition of the Town history. It will include significant events from 1990-present. "Now the fun part begins" where she sits down and interviews people on their recollections. This is an iterative and interactive process and she's looking forward to hearing from you. We're looking forward to publishing it sometime in 2012. A rose, is a rose, is a rose...not, at least when comes to Powder Post beetles. Montgomery resident and State forester, Dan Dilner, stopped by Pratt Hall early this summer and took samples of the bugs that are still active in the Hall. The State entomologist identified them as Anobiid Deathwatch beetles, not a true Powder Post but pretty much the same. Their name is certainly terrifying. The State also gave us a recommendation on what to use to treat for them. We will be working with business member, Paul Grenier, (Grenier's Pest Control) for another treatment, concentrating on the tower after the renovation project is completed. In an earlier newsletter we told you about a grant UVM graduate student Scott McLaughlin was writing aimed at improving the teaching of American history by putting together a network of teachers and local historical organizations. Scott reports " we were awarded the Teaching American History grant!" Two one million dollar grants were secured, one for southern VT and the other for programs in Chittenden, Franklin, and Grand Isle Counties. The Society will be a supporting organization. - A page showing Franklin County's and Montgomery's population from 1800 through the estimated 2010 census, and a page with all Franklin County towns' populations shown for the same period. Did you know Montgomery had as much as 6% of the population of Franklin County (1920)... and is projected to be about 2.5% in 2010? - A generic calendar list showing significant dates in Vermont, Franklin County, and Montgomery history. For example, October 21, 1988 - Pratt Hall placed on the National Register of Historic Places. These dates are also reflected on the online 2011 MHS Calendar. Let us know if you have an event or date you think we should add. 1. d. 1976. It was on the cover of that year's Annual Report. 2. a & d. The going train keeps the time and the striking train rings the bell the appropriate number of times every hour. A third train, called the chiming train is found on many clocks that chime every 1/4 hour, but not on ours. Dee Cumbie was the lucky winner of the Michael Domina print raffled off during the course of the summer ending with our Harp and Flute concert in mid August. Congratulations Dee! You can purchase your own copy directly by clicking the link above.